Although they are harmless to your overall health, spider veins makes legs seem unhealthy and aged when they begin to appear in a web-like fashion on the calves, shins, upper thighs and on the backs of the hands. Formed when impaired blood circulation and weakening of the veins’ walls combine to cause perpetual dilation of the veins, spider veins tend to radiate outward from a noticeably larger bluish-red area on the leg. This area is where a pool of blood has accumulated due to the inability of the circulatory system to push the blood through the veins. While spider veins cannot be felt when touched, bulging varicose veins are palpable and feel bumpy when you run your finger over them. Fortunately, a painless and simple vein sclerotherapy procedure can significantly reduce the unsightly appearance of spider and varicose veins. Are You A Good Candidate for Sclerotherapy? The majority of people considering sclerotherapy will experience little to no side effects from the procedure. 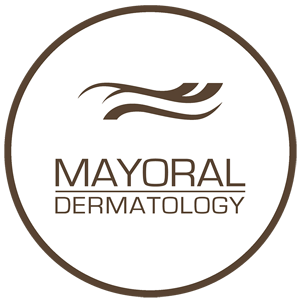 Prior to receiving injectable or laser sclerotherapy, a Mayoral Dermatology specialist will conduct a physical examination and ask you questions regarding your past and present health, such as whether you have been diagnosed with cardiovascular issues, have a history of vein thrombosis or are diabetic. Certain medications and chronic skin infections may also prevent someone from undergoing sclerotherapy. Participating in an in-depth consultation with one of our doctors is necessary to determine your candidacy and ensure that the procedure can be safely performed. After sterilizing the area to be treated with a topical disinfectant, your dermatologist will begin injecting a hypertonic saline solution into larger spider veins first. Generally, each inch or so of every spider vein that needs removed requires one injection of the sclerosant solution. The needle used during the procedure is very small; patients normally experience only a slight stinging sensation when the saline solution enters the vein. After all of the larger veins are treated, the dermatologist will start working on smaller spider veins. A typical injectable sclerotherapy session takes about 30 minutes or even shorter, depending on the amount of spider veins needing treatment. Your doctor may recommend that you wear a support bandage or hose for several days following the procedure to facilitate healing and enhance results. The saline solution is able to eliminate unsightly spider veins because of its ability to irritate vessel linings, reduce the diameter of blocked vessels and eventually force them to simply disintegrate and be absorbed harmlessly by the body. Blood circulation that previously required these vessels is simply re-routed by the circulatory system to healthier veins in the body. In addition to eliminated the visibility of spider veins, a sclerotherapy may also alleviate the pain and achiness caused by smaller varicose veins, since blood is now flowing freely through functional veins. How Many Treatments of Injectable Sclerotherapy Do I Need? This depends on the size of the veins as well as how many veins you want removed. Some patients are satisfied with results after one or two treatments while others may want several more sclerotherapy sessions. Follow-up treatments are given every four or five weeks in order to determine the full effect of the previous treatment. Although multiple treatments are not harmful in any way to your body, it is important that you engage in some form of exercise such as walking or stretching to stimulate circulation. Patients should also avoid strenuous activity for two to three days after receiving sclerotherapy injections. Instead of injecting a saline solution or foam, dermatologists will use intense laser light to eliminate spider veins. When the laser beam is aimed at the skin, hemoglobin (a protein containing iron that is responsible for transporting oxygen throughout the bloodstream) readily absorbs the energy of the laser light. This causes the blood within targeted vessels to coagulate, which encourages vein death and disintegration. Laser sclerotherapy is slightly more expensive than injectable sclerotherapy but is popular with people who have a needle phobia or have not responded well to the saline solution-style sclerotherapy. In addition, this kind of sclerotherapy may be recommended for extensive spider vein conditions or for the treatment of bulging varicose veins. For more information about sclerotherapy and the non-surgical removal of unsightly spider and varicose veins, call Mayoral Dermatology today to make a consultation appointment with one of our knowledgeable and caring specialists.